This is a list of bits and bobs which don't really fit anywhere else. In the late forties and early fifties, Dell produced a collection of very small pocket-sized books, really only big enough to hold a short story, called Dell 10c Books. Number 27 in the series is Thief is an Ugly Word by Paul Gallico. 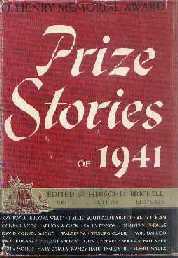 The story was originally in Cosmopolitan in 1944, and is included in Confessions of a Story Writer and also in Confessions of a Story Teller in the UK. In around 1942, the Pennsylvania Railroad company produced several tiny books containing short stories. These were intended as "entertaining literature [for] members of the armed forces travelling on military trains." This short story by Paul Gallico was first published in the Saturday Evening Post. This was a film, starring Judy Garland and Robert Walker, and directed by Vincente Minelli. It came out in 1945, and is about a whirlwind romance during the war. Paul Gallico is credited as the writer, and I believe that the story is based on a Gallico short story, but I have not found it in any collection. This book is a collection of three James Bond books - Casino Royale, From Russia, With Love and Doctor No. 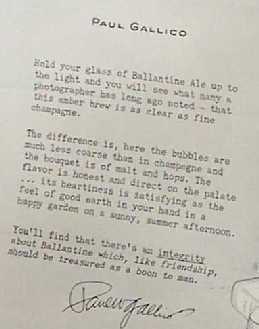 The books are, of course, by Ian Fleming, and the collection was published in the US by Macmillan in 1961, with a long introduction by Paul Gallico. It was not published in the UK. This is a novelette, published by Barrington Gray Ltd in Essex. It is pulp fiction, with a wonderfully typical cover. There is no date in the book, but I suspect it is from the early fifties; the story however seems to be very early Gallico - it was probably written in the thirties. Any more information about the story or Barrington Gray gratefully received! A made-for-TV disaster movie about a comet wiping out Phoenix, Arizona. It came out in 1978, and starred Richard Crenna, Elizabeth Ashley and David Dukes. Walter Kendrick wrote a novelization of the film, which was based on a story by Paul Gallico. This book is a compilation of sports stories by great sports writers, including Damon Runyon, Dan Parker, Jimmy Breslin and, of course, Paul Gallico. The book was compiled by A. Lawrance Holmes, and has an introduction by Gallico. 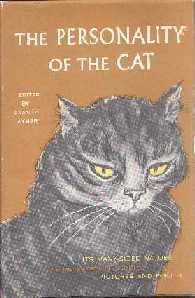 It was published in the US by Macmillan in 1967. Edited by Brandt Aymar. Published by Crown in 1958. This book contains lots of short stories and book extracts about cats; it includes a selection from Jennie. This is a softback booklet, published by Lederer, Street and Zeus Co. in 1968; it is number 26 in a Christmas series. 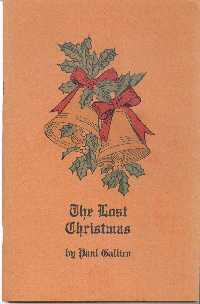 It contains an article (originally published in Esquire in December 1960), discussing the "lost Christmas" of the early years of one's life. It contains some lovely line illustrations. This is quite a rare item. By Steve Clark. 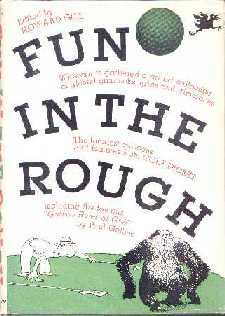 Published in the US by Grosset and Dunlap in 1976. With a foreword by Paul Gallico. This book is a collection of biographical sketches about famous Italian-Americans. 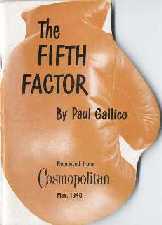 It includes a couple of pages about Paul Gallico. It was written by Robert Corte, and published in the US by Morrow in 1993. By Elizabeth Craig. Published in the US by Yoseloff in 1962. With a foreword by Paul Gallico. This is a collection of humourous articles and cartoons from Golf Digest. It includes the Gallico Rules of Golf - an eminently sensible set of modifications to the normal rules of golf - eg "A ball putted on the putting green that rims the cup and stays out shall be deemed to have dropped, since such an occurrence shall be held contrary to the laws of gravity, which supersedes the Rules of Golf". The book was edited by Howard Gill, and published by Prentice-Hall in 1957. Aside from the articles he wrote when he was a sportswriter, Gallico wrote literally hundreds - possibly thousands - of articles on general subjects for magazines both in the US and in the UK, as well as many short stories. If I find a copy of an article or a short story on the web, I'll link to it. But I'm not going to even try to collect the magazines containing the short stories or articles. Many of Gallico's best columns for the New York Daily News were collected together and published as small booklets on an annual basis. There is an interesting article here about the style of Paul Gallico's sportswriting, and how it compares to other great sportswriters. On a related theme, Nickolas Muray, Gallico's collaborator on The Revealing Eye, was an international fencer; he represented the USA in the Olympic Games in 1928 and 1932. 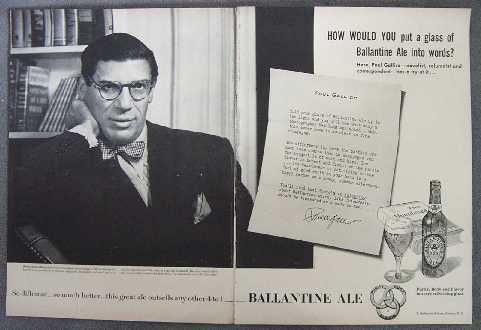 This is an magazine advertisement for Ballantine Ale in about 1951; celebrities were asked how they would put a glass of Ballantine Ale into words. Other well known writers who featured in this advertising campaign were John Steinbeck and Ernest Hemingway. This was a small booklet published in 1948. It contained boxing articles and stories originally published in Cosmopolitan. I have seen two or three references to Paul Gallico, Pulitzer Prize Winner on the web. But I have checked with the Pulitzer Prize web site, and it would appear that Gallico did not ever win a Pulitzer Prize. However, The Snow Goose was one of the 1941 O. Henry prize winners. I have seen these quotations on the web several times - but thanks to Bartleby, I can give them their full attibution. They are both in Simpsons Contemporary Quotations. Bob Gallico (or sometimes Robert Gallico) is Paul Gallico's son. He was an actor in the fifties and sixties, and has been a radio broadcaster for the last twenty years or so. He is currently a newscaster on Ireland Live Television, which is an Internet TV station. These pages are copyright © Martin Benson 1999-2003. You are welcome to link to them.